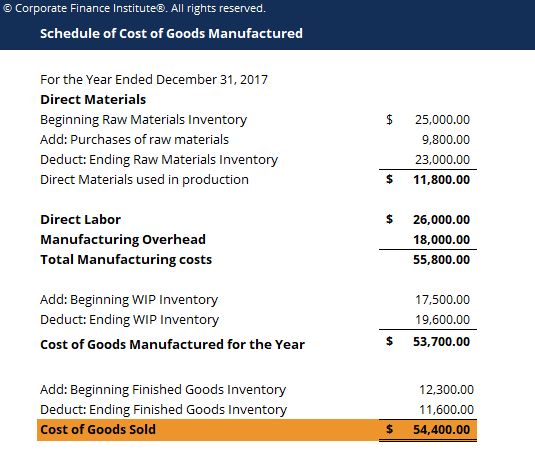 This cost of goods manufactured (COGS) template lays out a schedule of COGM using the amount of direct materials, direct labor, manufacturing overhead and work in process inventory. Cost of Goods Manufactured (COGM), is a term used in managerial accounting that refers to a schedule or statement that shows the total production costsAbsorption CostingAbsorption costing is a costing system that is used in valuing inventory. Absorption costing not only includes the cost of materials and labor, but also both variable and fixed manufacturing overhead. Absorption costing is also referred to as full costing. Under absorption costing, the following costs go into the for the company during a specific period of time. COGM is the total costs incurred to manufacture products and transfer them into finished goods inventoryInventoryInventory is a current asset account found on the balance sheet consisting of all raw materials, work-in-progress, and finished goods that a company has accumulated. It is often deemed the most illiquid of all current assets, and thus it is excluded from the numerator in the quick ratio calculation. for actual retail.